Hey, who doesn't need a little zeste de soleil right about now? (If it's warm where you are, no bragging please!) Zeste de Soleil is the latest flanker to Cartier's Eau de Cartier, a fragrance I've always liked but never adored quite enough to buy a bottle. It joins Eau de Cartier Essence d'Orange (which was not as wonderful as I hoped), Eau de Cartier Essence de Bois (a great pencil-shavings scent darkened with a drop of oud) and Eau de Cartier Goutte de Rose (which I have not smelled — do comment if you have). Zeste de Soleil is apparently meant to be the exotic-slash-tropical entry in the series; it adds passion fruit to the original mix of yuzu and mint. The top notes are the perfect antidote to the grey, dreary, rainy weather we're having here lately: an energetic burst of what smells like flash-frozen grapefruit peel — it's very bright and very yellow, and I'm surprised they did not use the perfume-speak term 'crystalline' in the description. They did call it refreshing, sunny, radiant, joyful and invigorating (among others); perhaps that was enough, and I'll vouch for all of it. The passion fruit appears after a couple seconds, and Zeste de Soleil gets sweeter and fruitier, but thankfully remains close by classic cologne territory instead of veering into fruity floral. It's lively and vibrant, and it stays that way for at least the next half hour or so. The mint is not heavy but it's there, and the dry down has a greenish, herbal cast over a pale woody musk. I wish I had some of the original Eau de Cartier to compare; going on memory, it's reasonably similar. Verdict: great fun, although admittedly, much of the fun is packed into the first 30 minutes. What's left after 2 hours is nice enough, what's left after 4 is verging on bland — about what you would expect from a summer eau. If it came in a smaller size, I'd consider adding it to my buy list, but it is not, for me, 50-ml-worthy. Still, I wish I had an automatic diffuser to spritz some in the air every 15 minutes or so for the rest of the winter; it would cheer me up immensely. Just as Eau de Cartier Essence de Bois skewed slightly masculine, so Eau de Cartier Zeste de Soleil skews slightly feminine, but a man could certainly wear it. Baiser Volé Essence de Parfum came out last fall. I believe it's the fourth iteration of Baiser Volé — it comes after the original Baiser Volé Eau de Parfum and its followups Baiser Volé Eau de Toilette and Baiser Volé Extrait de Parfum. We've already reviewed the first three so it seemed superfluous to do a full review of another. Here's the quick version: it's Baiser Volé's transparent lily rendered richer and warmer, with a more subdued green note and a hefty dose of creamy vanilla taking it straight into oriental territory. It's softer and less crisp than the Eau de Toilette, deeper than the Eau de Parfum, and going on memory, less earthy than the Extrait de Parfum. And it's by far the sweetest of the bunch. It's beautifully done and I found it very enjoyable to wear, but if I was going to buy a bottle of Baiser Volé it's not what I'd choose. If you like the idea of vanilla + lily but Baiser Volé Essence de Parfum is too heavy or sweet for you, you might want to try Hermès Vanille Galante. 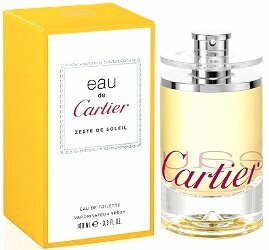 Cartier Eau de Cartier Zeste de Soleil is available in 50 ($67), 100 ($93) and 200 ($125) ml Eau de Toilette. 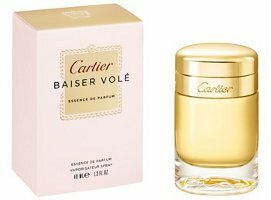 Cartier Baiser Volé Essence de Parfum was developed by perfumer Mathilde Laurent. It is available in 40 ($103) and 80 ($148) ml Essence de Parfum. Zeste de Soleil sounds a bit like Herba Fresca–do you find them similar? No, not more than vaguely related. This is fruitier & way less minty. Zeste de Soleil seems quite what would be great on this weather! You said that you wished a smaller size of it, so keep an eye on ebay, since cartier usually does not for sale 15ml sprays of the eau de cartiers. Then in all truth Zeste de Soleil is better suited to your weather than mine! I’d love to have little 15 ml sprays of all 4 Baiser Vole scents, they really should do a coffret. You never know, maybe I’ll get lucky! I have bottles of both the Parfum and the Essence, and love both! Haven’t tried the EDT, but guessing I’d like it as well. The Essence has been a “go to” fragrance for me this winter. A coffret would be cool!!! Also looking forward to trying the Zeste de Soleil! I LOVE passion fruit! And bet they look nice together…they did a great job on the packaging for Baiser. Yes, the bottles are really great! I’m wearing Goutte de Rose right now. It’s a nice, quiet scent, never really overtly floral, though there is a floralish topnote (and maybe some very faint whiffs of fruit) on me (if it’s anything specific, it’s not a flower I’ve much acquaintance with) that barely verges on herby and soapy before it goes sweetly-faintly woody and fades to an inoffensive and light dry-ish musky note and the floralish note from the top reappears in an even more subdued manner. It doesn’t project much, but the base sticks around pretty good, I get to my desk as 6:30 and spritz myself, and could still smell it before I spritzed myself again just now to figure out what I wanted to say about the initial impression. It’s not going to win any perfumista awards, but it is pretty. Thanks so much for the detailed review! Surprised it is not more floral, or specifically rose-y. Would you call it a unisex? Absolutely nothing rosey about it, honestly, other than being pink juice. And no, I wouldn’t say it was unisex, there’s something undeniably femme about it to my nose, although with layering magic, I could see it having enough neutral/unisex notes after the slightly soapy stage to make it wearable by even the least likely to floral men. Baiser Volé Essence de Parfum I tried in the fall when it came out all excited as I love Hermes’ Vanille Gallante, but alas it was way too sweet and not at all pleasant to my nose. It’s quite different than the other Baiser Vole’ options in my opinion. Would this be considered a flanker (I’m still a newbie), or no? It’s got the similar name and look, but a totally different fragrance and so… ? It’s got a different spirit, more gourmand, so yes…can totally see loving the originals but not this one. Yes, a flanker…it’s got the same name with an extension to the name and it has the same bottle. Flankers are sometimes totally new, sometimes not. The prior ones were just new concentrations, and again, sometimes new concentrations are very different, sometimes not — it’s all determined pretty much by how they name it and present it. I see. Good, and thank you! Oh hell, we had 39C here yesterday and we are pushing on to 40C today (104F). It will the same until Sunday (when we fly out to cooler climbs, thankfully.) Not bragging, believe me. Zeste de Soleil sounds pretty good. I’m not sure I have met passionfruit in a perfume. I wonder if pulpy fruit works well if you are combating dry heat and dry herbal colognes work best in humid heat? I took a spritz of Annick Goutal’s Neroli last night and regretted it. It seems bone dry to me and that was not what I needed. Humidity makes me think of “juicy” citrus scents, which isn’t the AG Neroli. I like the way Zeste de Soleil sounds. I often want a sunny and joyful scent in the middle of winter. It just kind of takes your thoughts away from gray skies and lots of snow outside. Me too…it’s a way to pretend it’s summer. Cartier Eau de Cartier Zeste de Soleil sounds good…I’ll need to hunt down a sample. I haven’t been to Nordstrom in a few weeks; they normally carry Cartier. Yay for sisters who share! I have a feeling what I’d like best is a dab of the Essence with the EdT or EdP layered on top? They’re all so well done though. DK Gold is much sharper than any of the BVs, but this one is the only one as warm as the dry down of Gold EdP. And I thought Gold was sheer on the lily, but the 1st 3 BVs are arguably even more so. The Essence is a much fuller floral, to my nose. Interesting! I sometimes enjoy the meaty-edge of DK Gold, but at other times I am put off by it. I only have the original BV EDP and the word I would use for the opening is crystalline in that it has this bright almost other-worldly fragility. I don’t mean it in the sense of effervescent or sparkly. I didn’t find this quality in the extrait or EDT. The very long white musk dry down of BV EDP is not as beautiful to me – it does have a certain clarity, but its not as focused as in the opening where the lily is more apparent. Also, it is almost frightening how tenacious and strong a perfume it actually is, given it’s dainty image – stolen kiss, et al! I wonder if you might like the Extrait better? But it’s spendy stuff. Thank you for your mini review of the BV essence. I have a bottle of the extrait and love it, but have always wondered if I should have waited and bought the essence instead. However you say the essence is sweeter (and not as earthy) so I am happy with my choice. The extrait is lovely in cold weather but I am also looking forward to trying it in the heat. My favorite Cartier is Declaration! I bought it for my husband but ended up using it more myself. I liked the EdT very much for the first hour- very crisp and green and not light! The Essence I found first too sweet for me. EdP is powdery and very elegant on my skin (but a little boring). After 3 hours the EdT disappeared, it was simply gone. The Essence was very good- golden, warm, lili-ish. Now, after 6 hours, I find it too sweet again. All three are nice but I haven´t to buy a bottle. BTW- the Essence is a bit smilar to Lys Soleia for me. If you can find it, do try the Extrait…I think many people who found the EdP too boring will like the Extrait.